Ally Bank offers a number of mortgage loan and refinance options with competitive rates. In July 2017, it began offering the Price Match Guarantee. This program encourages customers to report when they’ve found better pricing with another lender. Ally will then match that better rate, as long as the competitor’s loan terms are the same and the offer is dated within the past five days. It’s been a roller coaster for Ally’s home loan offerings. Ally Bank began as a division of GM in 1919, expanding auto loan financing to a wider variety of customers. Ally launched its first mortgage offerings in the 1980s. However, during the recent housing crisis, the company took big hits to its mortgage business. The losses were so significant that Ally decided to begin exiting the mortgage business in 2012. By June 2013, it had stopped offering any new mortgage products. But in late 2015, Ally announced its plan to re-enter the mortgage industry. Ally Home, the company’s direct-to-consumer mortgage offering launched in December 2016. In addition to Ally Home, the company also offers a wealth of other financial products and services across banking, credit cards and investments. Ally Bank operates entirely online, meaning there are no physical locations that you can visit. However, without any branches requiring upkeep, Ally is able to offer some of the best rates and products. Does Ally Mortgage Operate in My Area? Ally Bank offers mortgages in 49 states, plus the District of Columbia. However, as an online-only bank, it does not have any physical locations. To make up for this, Ally has an easily navigable website and almost 24/7 customer service availability over the phone. That said, if you’re someone who strongly prefers to meet with a loan advisor or bank representative in person, Ally Bank is likely not the mortgage lender for you. What Kind of Mortgage Can I Get With Ally? Fixed-rate mortgage: A fixed-rate mortgage works just how it sounds: the rate stays the same throughout the life of the loan. The most popular options are the 15-year and 30-year terms. Ally offers those term lengths, along with terms of 10, 20 and 25 years, each with their own interest rates and annual percentage rates. A fixed-rate mortgage provides a good option for people looking to stay in their homes for a longer period of time with steady mortgage payments. Adjustable-rate mortgage: An adjustable-rate mortgage (ARM) typically begins with a relatively low interest rate for a set number of years. After this introductory period, the rate will fluctuate according to its index. This means that at some point during your mortgage, you could benefit from an incredibly low rate. However, the opposite is also true, where you could end up with a higher rate. ARMs tend to work best for people who plan to move or refinance within a few years. When you look at ARMs, it’s not as simple as finding out the mortgage’s term length. Instead, two numbers will be given. The first number states the length of the introductory period while the second represents how often the rate will change. The most common ARMs term is the 5/1 ARM. This means the introductory interest rate stays in place for five years and after that, the rate will readjust every year. Ally Bank offers 5/1, 7/1 and 10/1 ARMs, each with its own interest rate and APR. Jumbo loan: A jumbo loan is a loan greater than the conforming loan limit for single-family homes in a particular county. In most of the country that limit is $453,100. This is the maximum amount that a Freddie Mac or Fannie Mae loan can back. However this amount can change depending on the state and county you are looking to buy property in. In some high-cost counties, the limit is higher. If you take out a mortgage that’s higher than the limit, you will have a jumbo loan. With Ally Bank, you can get any of the fixed-rate or adjustable-rate mortgages as a jumbo loan. Refinance: If you’re not quite happy with the terms of your current mortgage, you do have the option of refinancing your home loan. Refinancing involves changing the term length of your mortgage and/or the interest rate of your loan. You may also switch your mortgage from fixed rate to an ARM and vice versa. What Can You Do Online With Ally Mortgage? 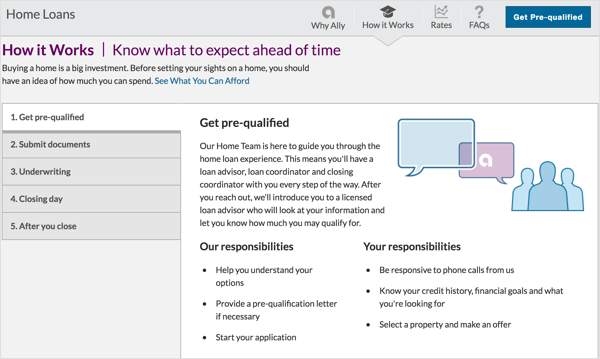 Ally Bank operates entirely online, with an easy-to-navigate website. You can easily see the rates and mortgage terms available. You can also contact a customer service representative to find out more about the products and terms before committing. When you’re ready, it’s easy as clicking a button to get the process started. Once you have an account with Ally Bank, you can access that and any future Ally banking accounts online as well. But if Ally Bank is servicing your mortgage, that's done through Cenlar, not Ally.com. So you'd need to log in to Cenlar.com to access your mortgage account. Would You Qualify for a Mortgage From Ally? When looking at your mortgage application, Ally will consider your credit score, debt-to-income ratio, down payment and employment history. Your credit score is important when it comes to a mortgage because the lender will want to see your history of spending on credit and repaying loans. You’ll need a credit score of at least 620 to be considered for an Ally home loan. Your score will also help determine your mortgage interest rate. Generally, if you have a higher score, you’ll snag a more favorable interest rate. You must also make sure you don’t have any hugely negative information on your credit report. When you apply for loans like a mortgage, the lender will make a hard inquiry into your credit report. If you have items like bankruptcy or charge-offs on your report, your chances of mortgage qualification will decrease significantly. Your debt-to-income ratio looks at your total monthly expenses as a percentage of your gross monthly income. This makes sure you don’t owe way more than you can pay back. Your employment history and stability plays into this factor, too. If you are constantly moving from job to job, a lender may see your ability to repay the mortgage as unreliable. Ally will also look at how much you can contribute as your down payment. As a rule of thumb, the ideal down payment would be 20% of the home price. However, this is not possible for everyone nor is it required. If you can put a higher amount down, you can see a better interest rate, a higher approval rate and smaller monthly payments. Ally begins the mortgage process by pre-qualifying applicants. This is done with the Ally Home TeamSM who works with you to understand your situation, information and goals. This will determine which mortgage options may be the best for you and then the next necessary steps. To make the process a bit easier, Ally Bank doesn’t require documents or fees to get pre-qualified for a mortgage loan. If you’re a first-time homebuyer, Ally offers access to Fannie Mae’s HomeReady mortgage program. This program is tailored for first-time homebuyers and for people who may not be able to make a large down payment. Homebuyers who qualify for this program can choose between a 25- or 30-year fixed-rate term. So if you were worried that Ally may not accept your application as a first-time homeowner, you’re in luck! What’s the Process for Getting a Mortgage With Ally? The first step toward getting a mortgage with Ally Bank is getting pre-qualified. To start this process, you can call the Home Loan department at 1-855-256-2559 and speak to a Home Loan Advisor. You can also fill out an online form to have an advisor call you instead. The Home Loan Advisor is the first person of your Ally Home TeamSM you will speak with. As you move along with the home-buying process, you’ll work with a loan coordinator and a closing coordinator, too. Your Home Loan Advisor is the person who will take a look at your information and help you determine which product, if any, would be right for you. This includes making that hard inquiry into your credit, as long as you approve the inquiry. If there is a product that you qualify for and are interested in, your Home Loan Advisor can then provide you with a pre-qualification letter. This letter will let home sellers know you’re serious about buying a home. Your letter will state how much you’ll be able to borrow from Ally. It’s important to know that while Ally will help you throughout the process, you also have responsibilities in the home-buying process. You will have to work with your Ally Home TeamSM by answering their calls and providing all the necessary and truthful information to get the best results. It will help both yourself and Ally to stay involved throughout the entire process. The next step will be to submit all the necessary documentation, which usually takes one to two weeks to complete. 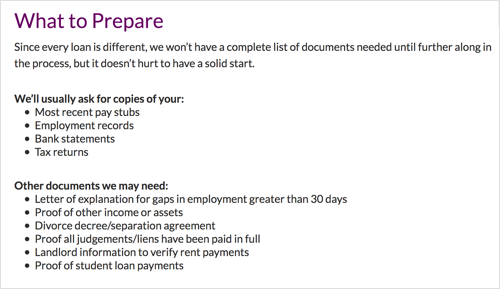 In this step, you’ll work closely with your loan coordinator to collect, review and sign all the papers and forms you’ll need. Don’t forget that this will all happen online and over the phone, since Ally does not have any physical locations. These documents usually include recent pay stubs, employment records, tax returns, proof of other income or assets, divorce agreements, proof of student loan payments and more. Your loan coordinator will also set you up with an appraisal company. Next comes the underwriting process, when Ally looks at and confirms all the documents you’ve sent in. This is when the final decision on your approval is made. If you’re approved for a mortgage, you’ll find out about your rate and loan term options. Your loan coordinator will keep you updated throughout this step. That way, you’ll always know where your application and mortgage options stand. If you’ve made it this far, your next step is closing day! This is when you meet with your real estate and closing agents to review and sign your closing documents. Be prepared to pay your closing costs, including your down payment, at this time. Within 15 days after closing, Ally will contact you to let you to let you know who will service your loan. You will not be making your mortgage payments directly to Ally. Instead, you’ll make the payments to the loan servicer. The terms of your loan are still set by Ally, who you can always contact with questions or concerns about your mortgage. When it comes to mortgages, Ally promises competitive rates and options for everyone. Remember you will have to have a credit score of at least 620 to qualify for a mortgage with Ally. It’s also important to note that Ally Bank does not offer any government-backed home loans at this time. This includes VA, USDA and FHA loans. Many of Ally’s competitors in the mortgage space that offer these valuable loans. So if you’re looking for a VA, USDA or FHA loan, you’ll have to find a different mortgage lender. Outside of these limitations, your Ally Home TeamSM works with you to find the best mortgage option for you, your financial situation and goals. Through every step of the process, you will have a member of the Home TeamSM guiding and helping you with the ins and outs of home buying. You also get to choose whether you would rather be contacted by phone or email. Of course, don’t forget that Ally operates entirely online. While you’ll have constant access to your application, accounts and coordinators, this will all take place over the phone or email and never in person. If that’s something you really want from a mortgage lender, you might want to reconsider working with Ally. Ally also offers a Price Match Guarantee, which ensures you get the best possible mortgage rates. With Price Match Guarantee, you can let the loan officer know when you find better pricing from another mortgage lender. When you’re ready to lock in your loan rate, you send Ally the other lender’s loan estimate. This document provides the other lender’s offer including all the terms and conditions, loan amount, rates, monthly payments and more. Generally, you’ll receive a lender’s loan estimate within three business days of receiving your application. Once you provide these documents and information to Ally within five business days of receiving the loan estimate, Ally will match that lender’s rate and points offer. Price Match Guarantee is eligible when Ally’s offer and the other lender’s offer are for the same loan terms. Another plus to Ally is that it is a full-service financial institution that offers bank accounts, credit cards and investment options. If you prefer to keep all your financial matters with a single institute, this may be a huge positive to you. There are pros and cons with all mortgage lenders and ultimately only you can decide what’s the best fit for you and your specific financial situation. When shopping around for your mortgage, it helps to decide a few things ahead of time. For one, do you plan to be in your new home for a long period of time? Or do you only see yourself staying for a few years? That way, you’ll know whether taking out an ARM or a fixed mortagage makes more sense. If you’re still undecided, a financial advisor can help you. Not only can a financial advisor determine which home loan makes the most sense for your financial situation, but they can also help in other areas of your finances. And we can help you find an advisor. Our financial advisor matching service takes your financial situation, advisor preferences and location into account and matches you with an advisor who meets your needs.